Plus the DC current of the 3.3V Pin of 30mA we get a total of 1110mA. Is this how one should go about doing the computations? If the adapter is insufficient will a 12 VDC 2A Power Supply Adapter be appropriate or excessive? Any links to read up on will be greatly appreciated as well. No. You have everything wrong there. First off, a power supply does not provide power. It provides voltage. The device attached to it then draws current. As much current as it needs at any particular moment in time. The current rating of a power supply is the maximum that the power supply can give. The same goes for Arduino IO and power pins: The current ratings are the maximum current you can draw from the pin. Exactly what current it will draw from the power supply depends completely on what is connected to what pins, and even what calculations the Arduino is doing at the time. To get a ball-park figure of current requirements you need to know the current requirements of whatever is attached. If a device has its own power input that is the current you need to worry about. If a device is powered directly from an IO pin (such as an LED) then that forms part of the Arduino's current (which starts at about 40mA or so for the board itself). The 5V regulator on the Arduino can't give more than 1A maximum, and considerably less than that when powered from a high voltage like 12V. The DC jack on the Arduino is limited to 1A due to a polarity protection diode. It is usually recommended to use a separate 3.3V regulator for an ESP8266 module (or 5V if your module has a built-in 3.3V regulator) due to the lack of power capacity in the Arduino's on-board regulators. So you'd be looking at 300mA as a minimum. More is better. 1A should be more than sufficient. 2A would be overkill but give a big margin of error. For everything you have there, it would be better to use a 5V power supply, not a 12V power supply. The Arudino uses a linear power supply. That type of power supply works by converting all the excess voltage above the output voltage to heat. So if you feed it 12V, at 1A, it has to convert 1 amp of 12V-5V, or 7 watts of power to heat. The heat sink on the Arduino is not up to dissipating 7 watts of heat. A linear power supply needs a little more than the output voltage. Feeding it 7.5V would be just about right. You should be able to get a full amp of 5V out of the Arduino’s power supply if you feed it 7.5V at the input, although the output voltage will probably droop some as you approach the max output, and it will get hot. Don’t put it in an airtight container. The Arduino draws a moderate amount of current all by itself. See the specs for details. Not the answer you're looking for? 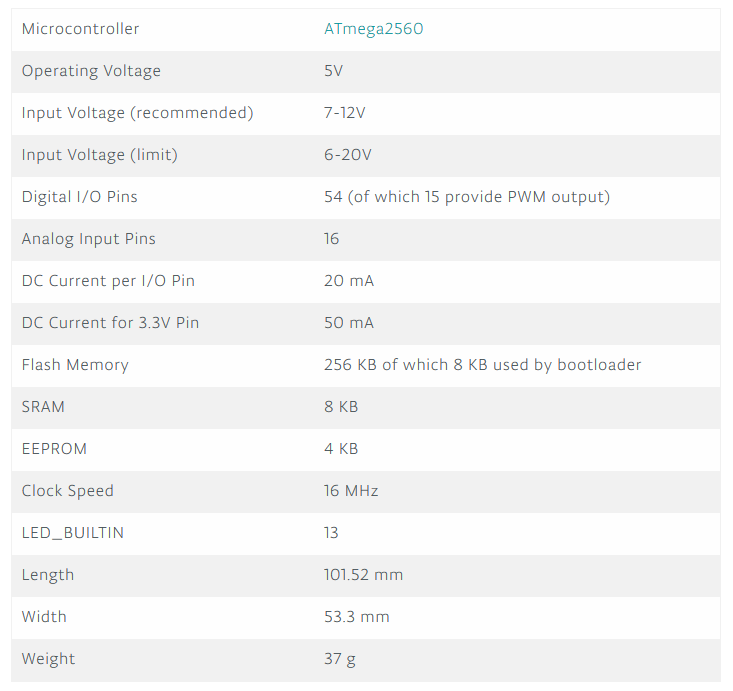 Browse other questions tagged arduino-mega power atmega2560 or ask your own question. Will 12.6v really damage my arduino?